By using the WordHTML.com web site you are agreeing to be bound by the following terms and conditions. We reserve the right to update and change this agreement from time to time without notice. Any new features or changes to the current WordHTML.com, shall be subject to this agreement. Continued use of WordHTML.com after any such changes shall constitute your consent to such changes. - Edit documents containing illegal materials. 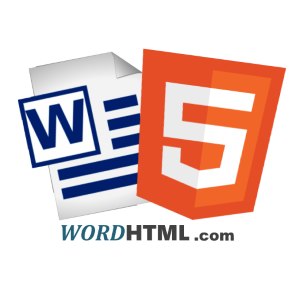 - Modify, adapt, translate, or reverse engineer any portion of WordHTML.com . - You may not use WordHTML.com for any illegal or unauthorized purpose. You must not, in the use of WordHTML.com , violate any laws in your jurisdiction (including but not limited to copyright or trademark laws). - The document editing is perfomed on client side and they are not sent to our server. - We will not share submitted data with third parties. - We use Google Analytics to collect anonymous visitor statistics. - The website is using cookies to enhance the user experience by saving your settings. - Third party cookies are used. See Google Analytics and Google AdSense privacy terms for more details. - WordHTML.com is provided as a free service, without any warrantee or guarantee, whatsoever. - We are not responsible for the correctness of your documents, checking them before publishing is your responsability. - We are not responsible for lost documents, keeping a back up is your responsability. - You understand that WordHTML.com uses third party vendors and hosting partners to provide the necessary hardware, software, networking, storage, and related technology required to run the Service. - We do not warrant that the service will meet your specific requirements. - We do not warrant that the service will be uninterrupted, timely, secure, or error-free. - We do not warrant that any errors in the service will be corrected. Use of WordHTML.com is at your own risk.